Eclectic Reader challenge – Horror. I know I have jumped a few but I really wanted to read Horns it has been on my night stand for months and I could put it off no longer! 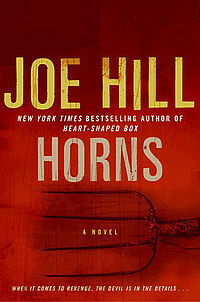 I have really enjoyed reading Joe Hill – his debut novel Heart-Shaped Box was one of those books that blindsided me with it’s intense and dark theme. His collection of short stories 20th Century Ghosts was equally brilliant and I can’t stop reading his comic Locke and Key. Horns is still in that dark horror zone and although from first impressions it hasn’t effected me as much as Heart-Shaped Box the theme and character have been with me since I finished it last night. The premise of Horns is basically dealing with loss of a love one – our protagonist Ig’s long term girl friend Merrin had been murdered almost a year earlier – he was the prime suspect with a weak alibi and intent (she tried to break up with him earlier in the night). We find Ig on the eve of the anniversary and a strange thing has happened – he has grown horns from this head, people tell him there darkest secrets and with a touch he knows all their sin. He can also persuade people to commit the sins they desire. He is the devil. Ig starts a quest to find out who really killed Merrin. The story jumps backwards and forwards in time, filling in the back story which basically leads the reader along with Ig to final climax and confrontation. This is almost formulaic, in that it has been done before – there is nothing earth shatteringly new in the story or even Hill’s writing – there is also nothing wrong with it! In fact it is a brilliant read – I had many a session where I just didn’t want to put the book down… I had to read just one more chapter. A great dark horror story, however if I had to recommend a Joe Hill book I still can’t go past Heart-Shaped Box maybe the theme of a musician ring truer with me, maybe it was the time and place. Maybe I build Horns up to much with it sitting by my bed for so long. Still it is not a bad book and I did enjoy it.